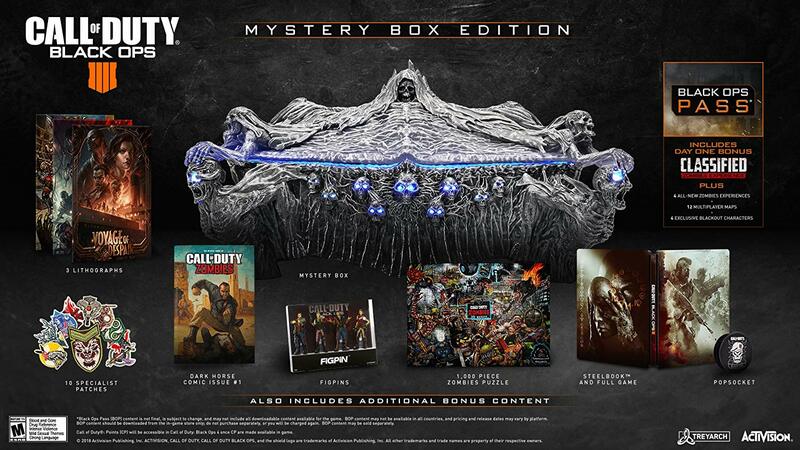 Super Punch: The Call of Duty: Black Ops 4 Collector Edition includes a zombie mystery box with "an eerie skeleton exterior and frightening sounds and lighting"
The Call of Duty: Black Ops 4 Collector Edition includes a zombie mystery box with "an eerie skeleton exterior and frightening sounds and lighting"
The Call of Duty: Black Ops 4 Mystery Box Edition comes loaded with a plethora of collectible items - including a collectible Mystery Box, 4 Exclusive Zombies Figpins, an Exclusive Zombies Puzzle, Darkhorse Zombies Comic with Exclusive cover, 3 Zombies lithographs, a Call of Duty: Black Ops 4 Pop Socket, collectible Steelbook, 10 physical Specialist Icon patches, and additional digital content for the ultimate Black Ops fan. Pre-Order now while supplies last. CALL OF DUTY: BLACK OPS 4 GAME - Black Ops is back! Featuring gritty, grounded Multiplayer combat, the biggest Zombies offering ever with three full undead adventures at Launch, and Blackout, where the universe of Black Ops comes to life in a massive battle royale experience. 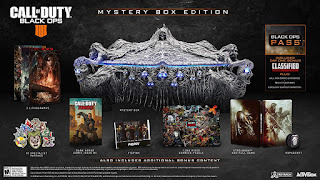 COLLECTIBLE ZOMBIES MYSTERY BOX – Inspired by the in-game Zombies Mystery Box, this collectible box features an eerie skeleton exterior and frightening sounds and lighting. 10th ANNIVERSARY ZOMBIES PUZZLE – This 1,000 piece puzzle features unique art celebrating 10 years of Treyarch Zombies history. POP SOCKET – With its intimidating skull logo, this limited edition Call of Duty: Black Ops 4 Pop Socket is the perfect way to show off your Black Ops fandom. COLLECTIBLE STEELBOOK - Limited edition steel game case featuring unique art. LIMITED EDITION SPECIALIST ICON PATCHES - Call of Duty: Black Ops 4 reintroduces the fan-favorite Specialists, each with their own unique weapon, equipment, and icons. This set of collectible patches is inspired by each of the 10 Specialists’ in-game icons. BLACK OPS PASS* - The Call of Duty: Black Ops 4 Black Ops Pass includes “Classified,” a bonus Zombies experience, available at Launch, 4 additional all-new Zombies experiences, 12 Multiplayer maps, and 4 exclusive Blackout characters.